DON'T SEE THE COLOR YOU WANT? 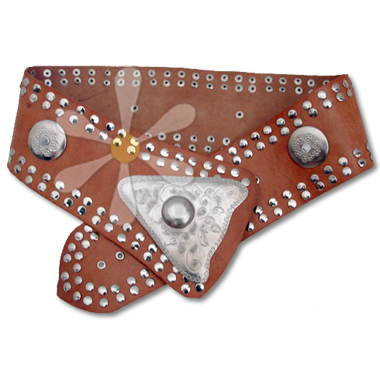 CHOOSE HERE TO PLACE SPECIAL ORDER* FOR THIS STYLE: With PATIENCE, you can choose from any belt color combination. The Morgana has a decidedly Celtic feel: wide and substantial, made by skilled hands and decorated with artisan-etched discs. The gorgeous etched triangular buckle anchors the fit, whether you wear it low on the hip or as a cinch at your natural waistline. No Dairi, Laise Adzer, or Tienda Ho aficionado should be without one!